Magnetic forces acting within the Sun cause loops of cooler plasma to extend outwards into the Sun's corona ( outer atmosphere ). 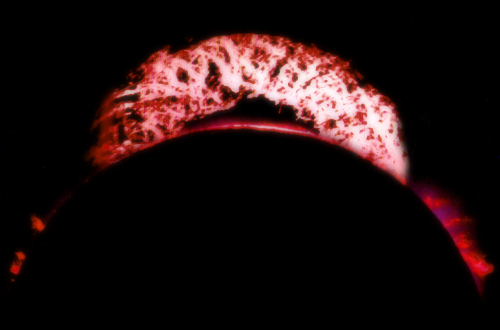 These loops are called 'prominences'. A coronal mass ejection (CME) is an ejection of material from the solar corona. The ejected material is a plasma, the core of which is composed of material from the 'prominence'. This material consists primarily of electrons and protons, but also contains small quantities of the heavier elements found in the Earth, such as oxygen, and iron. When the ejection reaches the Earth as an ICME (Interplanetary CME) and connects with the Earth's magnetosphere, it creates trillions of watts of power which are directed back toward the Earth's upper atmosphere. The mean distance of the Sun from the Earth is approximately 149.6 million kilometers (1 AU).